Our family lived in a foreign country for nearly 10 years between Costa Rica and Venezuela. We knew what it was like to stand out as foreigners because as much as we tried to fit in, we never fully did. All I had to do was speak and my accent gave me away—as if my looks didn’t already do it. In some cases I didn’t even try to conform to the other culture because there were parts of my home culture that I wanted to hold onto—like going barefoot, making peanut butter sandwiches instead of “arepas” or playing in a long awaited rain with mud squishing between the toes. We were so accustomed to being different that it wasn’t surprising that we still felt like strangers even when we moved back to the states. We were out of sync with life at “home” and had a new set of adjustments to make. Grocery shopping overwhelmed me. Greetings and farewells confused me. The school system consumed me. After 15 years in the states, I’ve definitely mastered the grocery store. But there are other customs in the culture that our family decided not to adjust to after all. We were strangers in Venezuela—living as foreigners and never completely fitting in, so we decided to stay strange in West Texas. 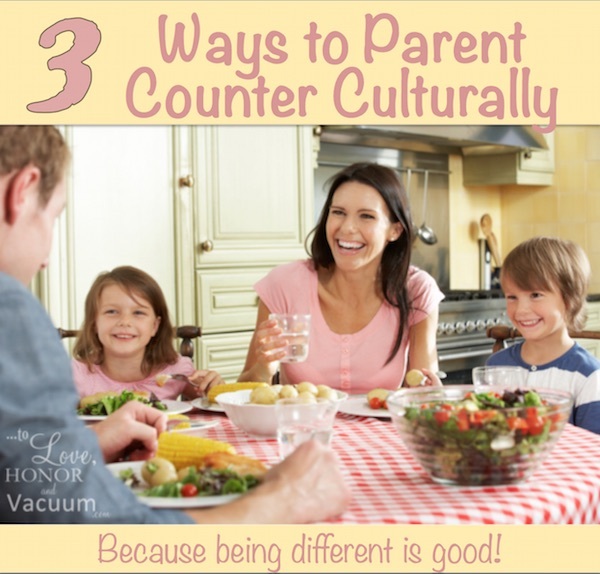 We’ve chosen to live counter culturally, breaking some of the cultural norms, for the sake of our family. In order to read the rest of this post, come on over to Sheila Gregoire’s blog, To Love, Honor and to Vacuum (a great blog for Christian women with honest conversations about marriage and parenting). I’m writing for her today, so click here to read the rest of this post to see the 3 ways that we choose to love our family with an accent in our home culture.